UK Prime Minister has said that London may increase its support to the White Helmets. The announcement comes in wake of the US halting its funding of the controversial NGO and evidence presented by Russia of falsified videos made by the group. Sputnik discussed the issue with Fares Shehabi, member of the Syrian parliament for Aleppo. Sputnik: In your view, why is Theresa May supporting the White Helmets despite the controversial information that exists about the group? Fares Shehabi: There is no controversy about this group. They were in Eastern Aleppo when it was liberated in 2016. We were there and we saw all White Helmets locations, offices, were the same as al-Qaeda* locations. Al-Qaeda, which has the branch in our area, which is called al-Nusra Front*, which are bin Laden boys; they take the orders from al-Zawahiri and Tora Bora. The al-Qaeda group sheltered, harbored, protected and helped the White Helmets. As a matter of fact also, most of White Helmets' alleged rescuers were also al-Qaeda terrorists — all the time they were carrying weapons and they were doing terrorism. When the camera comes nearby, when they start to shoot fabrications they would wear their rescue outfits and they'd try to fabricate some cheap propaganda rescue operation; clear-cut evidence that this is an armed terror organization. Sputnik: Why is Theresa May supporting this group? Fares Shehabi: Simply because the MI6 established this group. This group was not in Syria before the war. The Syrian Civil Defense was established as the legitimate and the only Syrian civil defense established in the 50's. And this is the only recognized the Syrian civil defense. This group [White Helmets] was established for one purpose: just to do cheap propaganda purposes, to beautify terror organizations and justify military action against the legitimate Syrian government. The British intelligence, through the organization, funded by the UK Foreign Office this shadow group takes the money from the UK Foreign Office and channels this money to jihadis. That was in documents that we found and that's the same thing found in different parts of Syria. Bear in mind that this group only operates under al-Qaeda, specifically in al-Qaeda jihadi controlled areas. Only. You don't find them elsewhere. 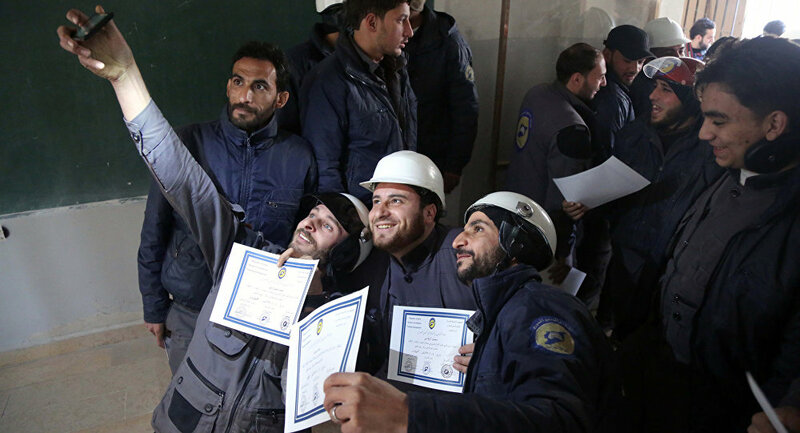 READ MORE: Deeper Look at White Helmets: Syrian 'Civil Defense' NGO or Jihadists' PR Arm? This evidence that we found show that the British government paid 200 million pounds in 2016 to this group. And they allocated 460 million pounds to be paid during 2018 to this group, again, through a shadow civil relief organization that really only channels to jihadi groups in Syria. We have evidence and we invite anyone that is interested in finding the truth. We have all the evidence; we have the names of these known terrorists that are getting money from the British Foreign Office. This is another arm of the British Foreign Office; it's their baby they will continue to fund it.